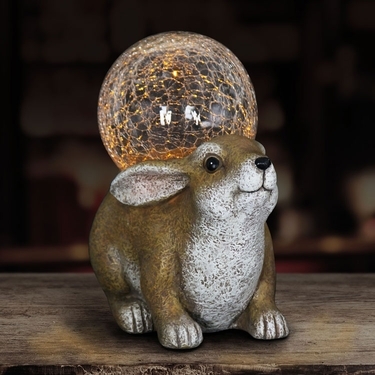 An elegant solar glass globe is nestled atop a sweet garden rabbit. Place this beautifully hand painted garden art anywhere in your landscape for a touch of glowing light and whimsical charm. Watch it automatically illuminate at dusk and enjoy its warm glow for up to 5 hours. Size: 6.5" x 10.5" x 11"H., approx 5 lbs.